The scary monster string lights from The Source in Melbourne make frequent magazine appearances in modern nurseries and are the perfect cool-but-not-too-cutesy addition for baby boys or girls. Ours came to a sudden death from a visiting toddler who quite naturally felt the urge to tug on them, thereby breaking bulbs and short-circuiting the cable. 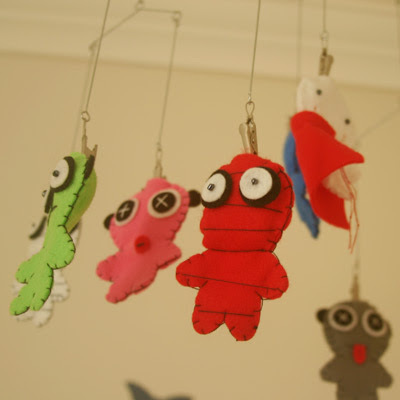 But fear not, the scary monsters were re-purposed into a cool mobile. 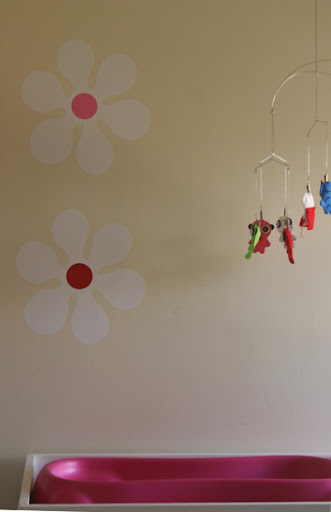 Simply clip the felt puppet shades onto a mobile with clips (like this Kikkerland hanging photo mobile), and Bob's Your Uncle. Cool factor without looking the same as everyone else.